Will President Barack Obama's Tucson speech affect his job approval ratings? 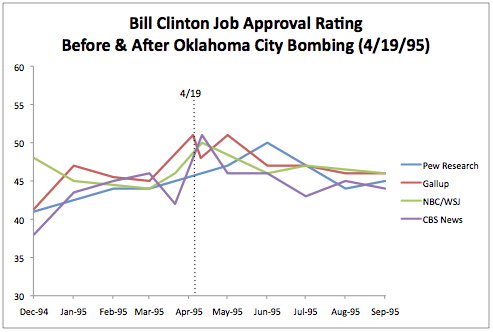 If public reaction to Bill Clinton's handling of the Oklahoma City bombing in April 1995 is a guide, Obama is likely experience a bump in his ratings, but if so, it won't be because of some new ability to "connect" or show "empathy." It will be because as with Clinton nearly 16 years ago, Obama reminded voters of things they already liked about him. "Clinton was at his empathetic best" in his Oklahoma City address, my colleague Howard Fineman recounted. "It reminded the public of what they liked about Bubba, and that -- more than any ideological 'triangulation' -- is what set him on the road to reelection the next year." The public response to Clinton then was very positive. A CBS News poll conducted two days after the speech found that 79 percent of respondents approved of his handling of the bombing. The aftermath of the bombing also coincided with a modest increase in Clinton's overall job-approval rating, rising from the mid-40s to near 50 percent in most opinion polls. However, as illustrated in the chart below, the bump in the polls was just that: A small, temporary increase that faded by summer's end. 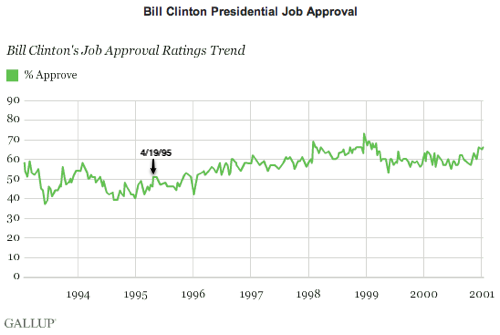 If we look at Gallup's more complete picture of Clinton's approval rating over the entire course of his presidency, we see that it rose slightly during 1995 and continued to increase steadily for the next three years. The Oklahoma City address likely did remind voters of what they liked most about Clinton -- thus creating the temporary bump in the late spring of 1995 -- but the real engine of his rebound was the ongoing revival of the U.S. economy. That year, the economy created an average of 179,000 new jobs per month, and the rest of Clinton's presidency saw an average of more than 200,000 created per month. Predictably enough, reporters and pundits are already advancing the narrative that Obama used his Tucson speech to better "connect" with voters, a perceived shortcoming that some use to explain his low job-approval ratings. During Thursday's press briefing, for example, one reporter asked White House Press Secretary Robert Gibbs about the degree of "empathy" in the speech, "because in the past it's been noted that perhaps he wasn't as forthcoming with empathy as some of his predecessors." Obama's speech "seem to resonate this time," another reporter said in a question, due to "the personal aspect of this tragedy," also noting "criticism of him in the past in terms of not really being able to empathize with folks and the comparisons between himself and Clinton. Those really went by the wayside last night." [W]hen it comes to the president's personality, voters still like what they see…he gets his highest marks for having a strong family and family values (74 percent give him a high rating here), being easygoing and likeable (68 percent), being inspirational and exciting (51 percent) and having strong leadership qualities (49 percent). Better yet, consider these results from the just-released Pew Research survey. The results from early January are virtually identical to those from June in showing that the overwhelming majority of Americans have long been convinced that Obama is "warm and friendly" (70 percent in January) and a "good communicator" (75 percent) who "cares about people" (60 percent) and is "trustworthy" (58 percent). These are not the numbers of someone who has previously had a problem personally "connecting" with the Americans people. Even as President Obama's job approval numbers sank last year, Americans said they liked him personally, in part because he was so devoted to his family. It was that unassuming role -- father and husband -- which enabled Obama to turn his Tucson speech into a memorable moment of healing and hope. So if Americans like Obama personally, why is his job approval so much lower? Look at the top half of the Pew Research table above. Most Americans like their dad next door, but they have not yet seen enough tangible progress on the issues they care about, especially on the economy. If and when the economy comes roaring back, Obama's approval ratings will, too.